I have to admit that I didn’t really know what to do with Snapchat until recently and if this trendy social media tool was even something for me. After looking through the app a few times, it all seemed confusing and to be honest also a bit silly to me. But at last my curiosity won over and I thought to myself “You have to give this Snapchat thing everyone is talking about another try!”. So I looked for a quick way to learn more about Snapchat by watching a “How to Snapchat” YouTube video. This helped me a lot to get an overview about the app and an idea on how to use it. I also started following a few people to see how they used Snapchat. After a couple of days I got into it and now I really start to enjoy Snapchat. In my opinion it gives you a lot of flexibility and freedom to use it in a creative way. I also like that nothing has to be perfect, since your snaps are only visible for a short period of time. This takes the pressure off and it’s easier to get started. But now enough of me talking about my first experiences with the app. I quickly want to show you how you can promote your Snapchat account on your WordPress website. 1. 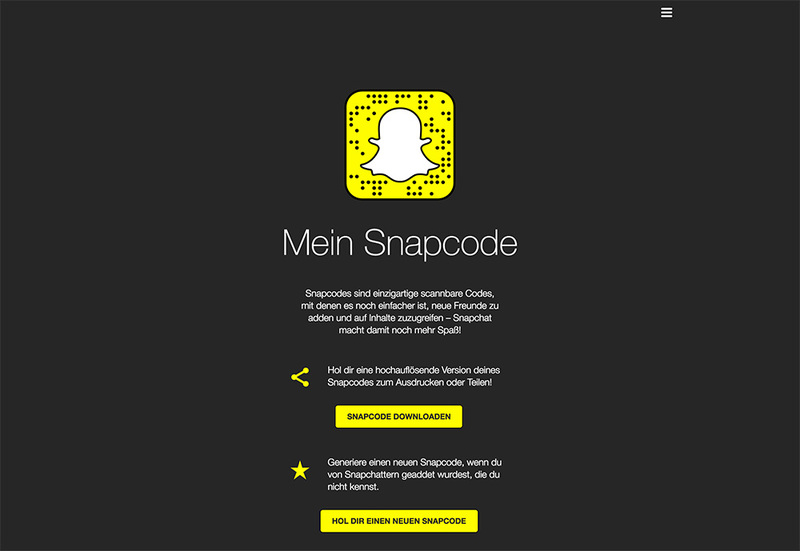 What is a Snapcode? Every Snapchat user will receive a snapcode. A snapcode is a Snapchat profile picture with a unique QR code that other users can scan to add you to their Snapchat account. The snapcode is an easy way to add new friends to your Snapchat, so you are able to see their snaps and stories. To get your snapcode you need to log into your account on this Snapchat site. After logging in you will see a download link to download a zip folder containing your snapcode image in png and svg formats. How to download your snapcode image on Snapchat. Now that you have your snapcode image you want to add it to your WordPress website, so that your visitors can add you to their Snapchat by scanning the image. 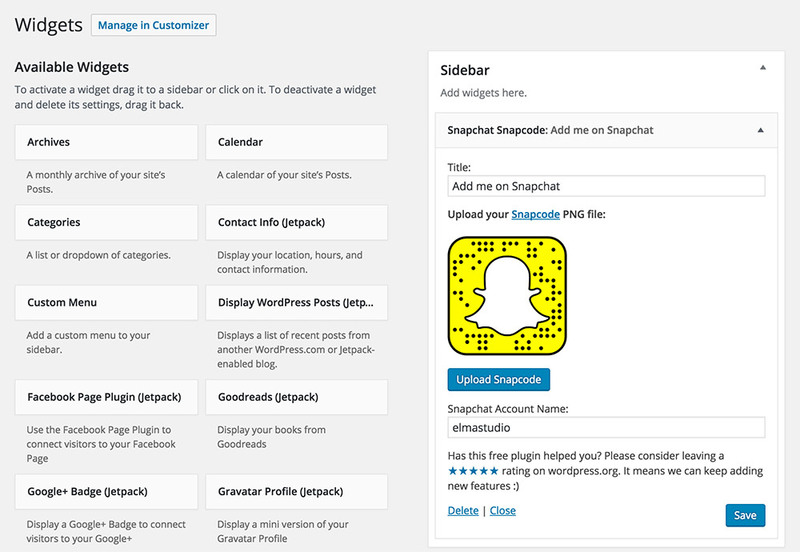 The easiest way to add your snapcode to WordPress is using the Snapchat Snapcode Widget plugin. After the plugin installation you will see the new widget under Appearance / Customize / Widgets (or under Appearance / Widgets). In the widget settings you can upload your png snapcode image and include your Snapchat user name. So you only need to change “profilename” to your own Snapchat user name (e.g. https://www.snapchat.com/add/elmastudio). 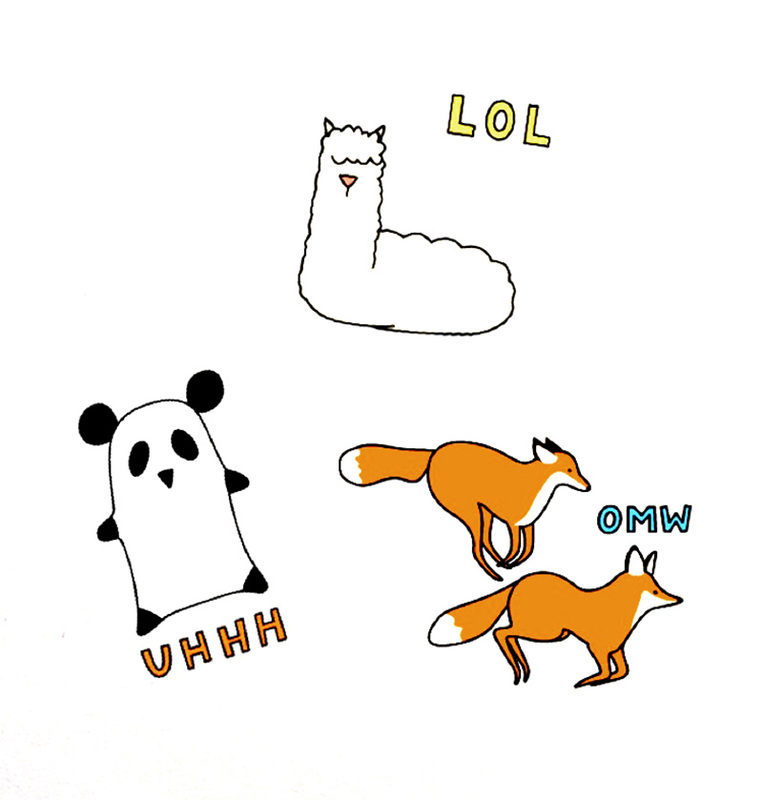 How do you like Snapchat? What kind of experiences can you share using the app? Do you have further tips on how to add a Snapchat profile to a WordPress website? Please write me a comment below, I would love to hear your feedback and opinion!